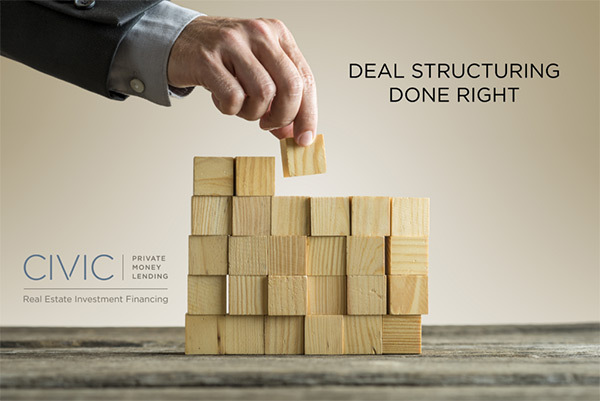 At CIVIC, we understand that deals are not always simple and straightforward. More often than not, there are complexities with a particular scenario discovered during the original vetting process. Or, during the evaluation process and after an appraisal has been ordered and received, additional situations are presented that can create a few twists and turns. Yet we have the ability to craft an approval around a specific project and not try to fit every opportunity into a rigid box. This is the opportunity for deal structuring to get done right. For example, an investor identifies a lot with several small, older homes located there. The investor needs short term financing to acquire the property, tear down the homes, subdivide and obtain proper permits for a future project. This is something that CIVIC is skilled at and just another example of the types of projects we’ll approve by looking beyond the horizon to understand the end goal. We like to say that if a project doesn’t fit within our box, we’ll build a special box for it. Our clients know that we’ll entertain most projects as long as we can see the end game and how the investor plans on paying back the loan. A solid exit strategy helps us create a custom lending solution that provides funds quickly and when they’re needed. Sometimes we approve projects that are fairly straightforward. An investor needs funds to buy an apartment building but the building needs some upgrading in order to receive permanent financing. The investor provides us with the scenario, what the funds will be used for, how long it will take to make the needed repairs and finally when our loan will be replaced. We look at the property’s value both in its current condition as well as its future value once the repairs have been made.